While many people search for a safe rawhide alternatives, another option is to buy high quality, safe rawhide bones for your dog. Many people despise rawhides and consider them always unsafe no matter what. That conclusion is understandable because of the type of product low quality, crappy brands sell. 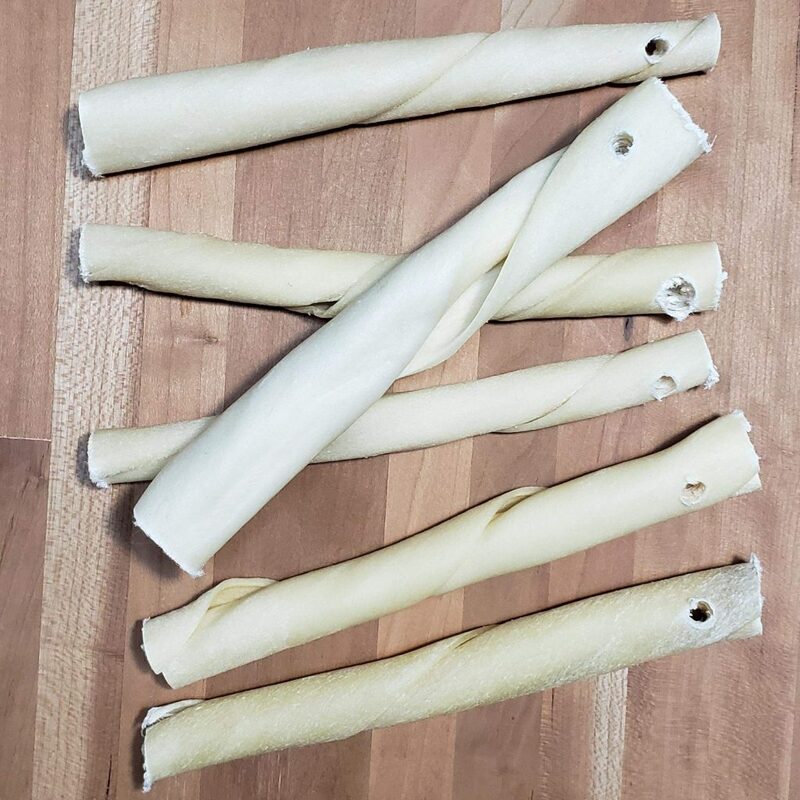 Some poorly made rawhide chews use small scraps in the middle as filler which can fall out during chewing. These loose pieces are generally hard, and have not had time to get softened by the dog’s spit. So the hard piece can get lodged cross-ways in the throat. As was testing rawhides during the development of EverChew, I would sometimes cut a rawhide in half. The lower quality brands had small pieces fall out of the fresh cut ends. Higher quality safe rawhide chews for dogs like Tasman’s brand, only use large sheets in the roll, so nothing falls out of the fresh cuts. Another issue with poor quality rawhide chew bones is that they are highly processed in baths that can leave unsafe contaminants. Since we use high quality rawhide chews, we’ve not had any issues. Our rawhide supplier is Tasman’s Natural Pet, and there’s a lot of info on their FAQ page (http://www.naturesbestrawhide.com/faq.aspx). If you visit their page you see how the describe that they only process with hydrogen peroxide, and then only mildly. That’s why the colors of their rawhide chew treats are variable. Are your rawhide chews made in USA? Mostly. We will be using Tasman’s rawhides. They are sourced from USA beef, bison, and wild boar. The final processing is done at a plant in Mexico, so the Tasman team keeps a close watch on the quality that way. No far away plants that are only visited every few years, if ever. Are you ready to buy EverChew rawhides now? The EverChew store has pre-drilled EverChew rawhide sticks. But, many people have asked how hard it it to make holes in their own chews. Answer: it’s easy to do with a simple 1/4″ drill bit. The video has a super fast demonstration of drilling a hole in a bully stick treat and making it into an Everchew safe chew treat. Drilling the hole in a rawhide stick works exactly the same.